The regime has only delivered empty words, and its explanation of the situation is contradictory and deceiving. In the summer, the regime's supreme leader, Khamenei, said that "not all our problems stem from the sanctions but from internal issues and the way of our management and policy-making". Afterwards, Rouhani, the regime's so-called president, referring to the US sanctions, said: "The country is in a state of war and the people must tolerate the problems". But later he, like Khamenei, confessed that not all of Iran's problems could be attributed to sanctions. The economic crisis led to protests in December 2017, which heralded the beginning of a new phase of class struggle. However, the subsequent nationwide crackdown on protesters and the arrest of more than 4,000 people could not put the genie back in the bottle. In August 2018 protests occurred in tens of Iranian cities and towns. These protests, like the ones in 2017, had two characteristics: firstly, they were fully independent from both factions of the regime and fully mistrusting of both. Secondly, the bulk of the protests were comprised of the poor, workers, and women, especially in remote and small towns. Countless small and big campaigns, pickets and demonstrations by workers, women, university students, environmentalists, shopkeepers, farmers, lorry drivers and depositors in bankrupt banks filled the gap between the peaks of the protests, and with every step, the people and workers have learnt new lessons. Currently, the pinnacle of the new wave of protests is the strike of workers at the Haft-Tappeh Agro-Industry Company. Haft-Tappeh is located in the north of the oil-rich Khuzestan province of Iran. The company cultivates sugar cane in 100,000 hectares. It can produce 100,000 metric tonnes of sugar a year but the actual production is about 50,000 metric tonnes. The government declared the company bankrupt in the mid-2000s, and decided to sell it off to the private sector. It was privatised in 2015. Privatisation saw the number of workers reduced from 7,000 to 4,000. The workforce, especially in the plantation, suffers intolerable and tough conditions in the area's extreme humidity and high temperatures. A government report says the company suffers from inadequate liquidity, uses obsolete technology and has high production costs. Some sources also refer to lowering the tariff for imported sugar that dealt a blow to domestic sugar production. Workers have been victims of the crisis in capitalism and corruption and mismanagement. 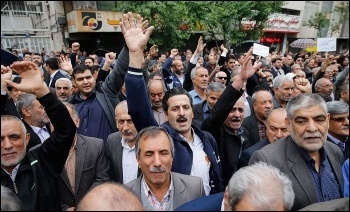 Haft-Tappeh workers have frequently gone on strike over unpaid wages. Their strike in September ended after the bosses agreed to pay the owed wages. However, the failure to pay the wages for four months caused infuriated workers to not only go on strike again from 4 November, but extend their protests to the nearby town Shush. On 16 November, Haft-Tappeh workers occupied the Friday prayers compound to voice their protest in the regime's heart of power. They disrupted the state-organised religious ceremony by roaring angry slogans in which they called the religious official 'an enemy of the people'. The following day, the workers, together with their wives and children, took the streets of Shush, and thousands of the town's people joined their demonstration. The Haft-Tappeh strike has shown the rise of class consciousness among workers with every step they have taken. Esmail Bakhshi, one of the Haft-Tappeh union's leaders, said: "Workers no longer allow the private sector to control the company, and if the government wants to take over, all the company's business must be managed by the workers' council and based on collective decision-making." Loads of videos and photos went viral on social media, each displaying a dazzling scene of workers' rising consciousness. In one video, workers chanted "bread, jobs, freedom, council management". This slogan was not only a direct attack on the regime and its tyrannical and barbarous rule but on the pro-imperialist, pro-monarchy and right-wing opposition. Both counter-revolutionary camps alike dread the slogan. Women workers bravely appeared as speakers and invited workers from all over the country to support the Haft-Tappeh strike. Workers in other industrial centres like Arak and Ahvaz declared their solidarity. Workers of the steel company, on the sixth day of their strike, held a rally in Ahvaz, the province's capital, and enthusiastically expressed solidarity with Haft-Tappeh workers. An amazing video showed a woman teacher attending the workers' picket and saying she came to the workers because no protest had happened in her town and she decided to voice teachers' demands at the workers' rally. The regime sent riot police forces to Shush on 18 November to intimidate the hungry workers. Later, fearing that using force might pour fuel onto the fire, the regime evacuated its forces from the town. However, the regime arrested about 20 workers, including Esmail Bakhshi, and a female journalist who was preparing a report on the protest. Undoubtedly, the regime may use force and arrest more workers, but hungry workers have nothing to lose but their chains! In less than one year, the Iranian working class has taken big leaps forward. These expanding struggles have loosened the regime's grip and created a space, though still shaky and narrow, for political activity among the working class. A number of Iranian left parties in exile have started an attempt to organise united actions. This must be linked with developing a network of workers' movement activists and leaders inside the country, and raising the flag of internationalism and lining up with the world's working people's struggles.